How did everything start … People began to print a lot, so they needed many printers. The printer market also began to develop. And then manufacturers understood that more money can be earned not from printer sales, but from sale of consumables: ink and paper. 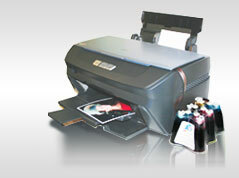 Manufacturers began to set low price for printers, and very high - for cartridges and photo paper. In order to prevent cartridge refilling, clever chips and "adjustments".were created. But one day the price for cartridges became too high, and a smart person placed tanks with ink and stretched tubes to cartridges from them. So continuous ink supply system appeared. Today CISS is available in each country of the world, in the same way as consumables for cell phones or replacement parts for cars. The main thing as with any compatible supplies, is saving money but preserving quality. This idea - to receive high quality at low price – is the framework of INKSYSTEM. The quantity of our partners is growing fast, which demonstrates the high quality of our products, good prices and complete set of services for our clients, from warranty and loyalty programs to constant expansion of product range. Our experts estimage that about 93 % of users of inkjet printers today use original catridges. At the same time, three years ago this indicator was 98 %. We plan that within the next 5 years the market of printer accessories will grow by 500-600 % and the share of compatible materials will grow from 7 % in 2009 to 40 % in 2014 at the expense of improvement of quality of used materials, active advertising and advancement of this technology, and also eternal aspiration of people to save where it is possible not to overpay.